Tokyo, Japan – April 3rd, 2017. The jury has reached its decision: After several days of assessing more than 5,500 products from 54 different countries, Palmo iPhone Case received the distinction “Red Dot”. With Palmo, ECBB Co., Ltd. (Tokyo, Japan), a leading manufacturer and designer office of high quality made-in-Japan gadget accessories, has created an outstanding design that the expert committee for the Red Dot Award: Product Design 2017 has recognised with the internationally sought-after seal of quality. 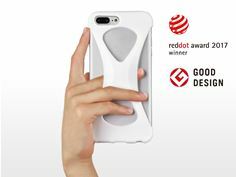 Palmo is the only award-winning iPhone case or case for other phones in the category “Mobile phones, tablets and wearables” in the Red Dot Award: Product Design 2017. It is an ultralight anti-shock fall-prevention iPhone case specifically designed for reducing smartphone disabilities such as “text neck”, “text thumb” and finger distortions. Its ergonomic design and flexible silicone material allow a finger to be gripped between the phone and the case, which not only prevent the phone to fall off a palm, but also provide improved stability with better single-hand control and reduce unconscious stress for dropping the phone. Its minimalistic X-Form design efficiently dissipates heat off the phone while it effectively protects the corners of the phone. It has been tested by a third party laboratory (Institute of Sport, Senshu Univ. – Tokyo, Japan) for reducing smartphone disabilities and psychological stress, and validated performance by the US Military for its shock/drop resistance (MIL-STD-810G). For its visually and sensually smooth design, Palmo has also won Japan’s notable design award (GOOD DESIGN AWARDS 2015). Palmo, with its design patented/patent-pending in EU, US, China and other major countries, is compatible for all the recent iPhone/iPad models and available for sale not only on ECBB’s EM Store but also on the following Amazon marketplaces – UK, Germany, France, Spain, Italy, USA, Canada, Mexico and Japan (See also Appendix 1 for availability in each marketplace). Palmo will be exhibited at the Red Dot Design Museum Essen from July 3rd, 2017 along with other winners. The Red Dot Design Yearbook 2017/2018 also comes out on July 3rd. The international reference work for award-winning design presents all of the year’s winning products including Palmo. They will also be presented on the Internet, in particular in the Red Dot online presentation, the Red Dot App and on the design platform Red Dot 21. To share the success, ECBB is actively looking for retail and distribution partners from all over the world. In addition to press inquiries, please contact ECBB for any business inquiries as well. ECBB with its headquarter in Tokyo, Japan, was founded by Yasuhiro Matsuura, CEO, in 1999 to provide engineering and IT consulting services. In 2015, ECBB enters into a manufacturing and designing space and won its first award at GOOD DESIGN AWARDS 2015 in Tokyo, Japan for Palmo iPhone case. ECBB owns its designing office in Tokyo and operates a free school in Bangladesh for orphans to help their educational development. More information is available at https://ecbb.co.jp/en. Press & Business contact at ECBB Co., Ltd.